How to configure time zone, currency or date? 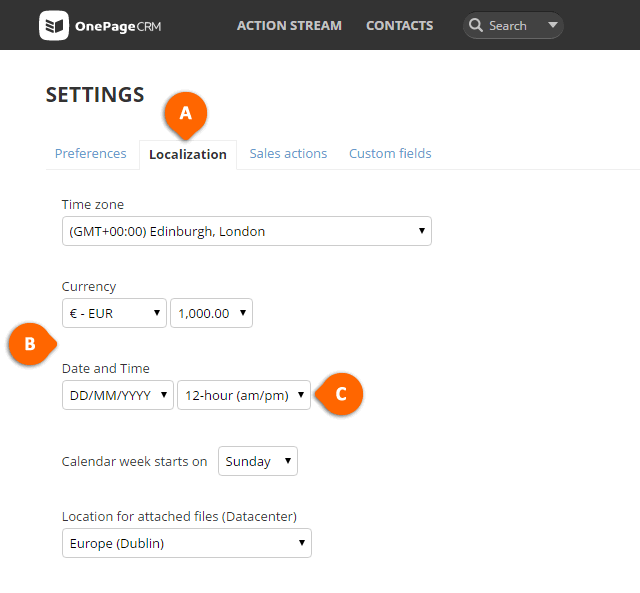 You can set your preferences for Time zone, Currency or Date from within your OnePageCRM account. Go to gear icon > Settings > Localization (see A). Choose whether you want to view time settings in 24-hour or in 12-hour (AM/PM) format (see C). Sub-users are only allowed to set their preferences for Time zone and Calendar week starts on. Other settings are only available to Account Owner or Administrator. Selecting an option from any of the drop down menus will save automatically.